You're going to Ireland to dry up? 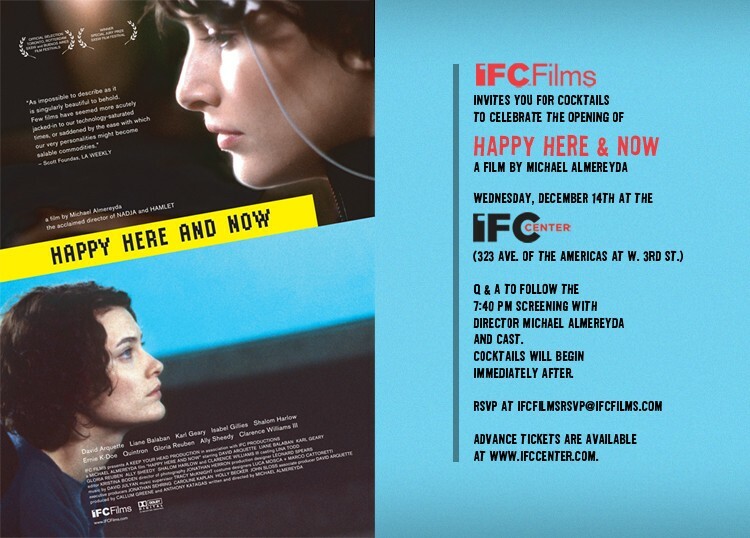 IFC Films announces the release of HAPPY HERE AND NOW, the latest from visionary filmmaker Michael Almereyda (HAMLET, NADJA, WILLIAM EGGLESTON IN THE REAL WORLD). Featuring terrific performances from an ensemble cast Karl Geary, David Arquette, Shalom Harlow, Liane Balaban, Clarence Williams III, Ally Sheedy as well as cameos by musicians Quintron, the Rebirth Brass Band, and the late, legendary Ernie K-Doe - HAPPY HERE AND NOW employs the unique character (and diverse musical sounds) of New Orleans as backdrop for a richly layered story of connection and disconnection in the contemporary world. Winner of the Special Jury Prize at the SXSW Film Festival and an official selection of Rotterdam, Toronto and the Film Comments Selects series, the film will open in New York on Wednesday, December 14 at the IFC Center. With this film, writer/director Almereyda furthers his exploration of the ways in which people use media and technology as an extension and expression of their own conflicted lives. A mystery in the deepest sense, HAPPY HERE AND NOW considers the masks emotional, physical, and digital that we wear, and that reveal as much as they hide. "As impossible to describe as it is singularly beautiful to behold." Premieres Wednesday, December 14th & December 16th (7:40pm) at the IFC Center in New York City. Mr. Almereyda will be making an appearance at both premieres. Shooting has wrapped on Almereyda's new film Tonight At Noon. There's a blurb over at IndieWire which includes an updated cast list and synopsis. IMDB has a relatively blank page on the film, but always good to keep an eye on it. William Eggleston in the Real World is being screened around the country in the upcoming months. A full schedule can be found here. There was a nice article on Almereyda and Eggleston in this past Sunday's New York Times. Tonight's 6:30pm screening of William Eggleston in the Real World at the Film Forum will feature a Q&A with Eggleston and Almereyda following the film. The 8:30pm showing will be introduced by Almereyda.